← New architecture resource – try it now! This session many more academic staff are taking up the Talis Aspire online reading list and digital content management system which the University invested in last year to improve students’ learning experience. It was phased in by certain departments last academic year and linked to Blackboard. 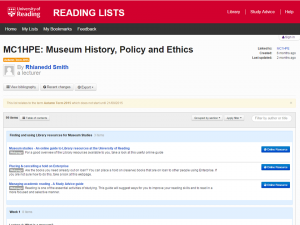 Tutors create and own annotated lists providing direct links to online resources, scanned reading and real-time availability of University Library print material. If you have not seen one before, try this short introduction to your online reading list. It shows how the system helps you manage your academic reading and prepare for assignments by checking real-time availability of Library materials, sorting your reading list by importance (‘essential’, ‘recommended’ or ‘further’ reading), mark up items you have read, or add private notes. Check out our Online reading lists: a guide for students. For individual help with existing lists, contact your subject liaison librarian. This entry was posted in Borrowing and viewing material, General news. Bookmark the permalink.